What does your display case look like? Discussion in 'Show Your Collection' started by Hank, Mar 26, 2012. I'm curious what everyone's display cases look like. I'm trying to get ideas on how to re-organize and display my stuff. I'm also in the never ending process of re-doing my entire office layout. Any cool ideas would be welcomed. Here's a shot of mine from about a year and a half ago. GREAT thread idea and since I'm currently in the process of having one built this is especially interesting for me! btw, nice looking case there Hank! I've always been a fan of your display case Hank, it's super fancy. I added some info on my case. Maybe everyone else could also do the same? It was expensive but we had a gift card and a coupon to take down the price a bit. Definitely happy with the purchase. I went to Ikea the other day to check out a wall shelf that I had seen online. It's actually REALLY nice, mounts to the wall as to not take up floor space, and is pretty much dust proof... and it comes in various depths. Here is the 7.5" deep one that I was looking at. 2 detolfs on both sides of my tv cabinet. @ sensensempompom - I really like that case! It has a really cool feel to it. @ Cubensis - I was just checking those out the other day. I don't have room for them but I think they are awesome. I like the idea of displaying a holy grail type of area. That would be perfect! @Hank - in terms of ikea that Liatorp is nice. plenty of room. i like how you have glass shelves mixed in and the staircase display to take advantage of the height. @Cubensis - also nice. very clean look. i like recycling. you can find really nice vintage stuff. although it can be more work to prep. and find. 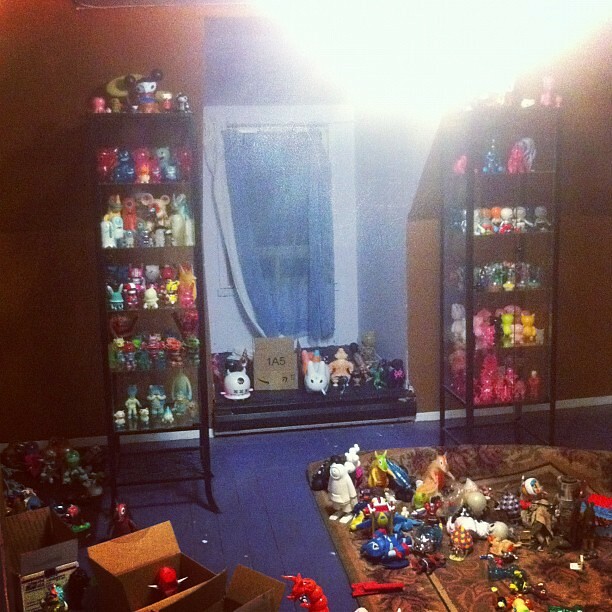 also my shelves aren't very deep and at the rate i'm going i'll need more space soon enough.
? the idea was to limit myself to this one display case. @Jace76 - can't wait to see. 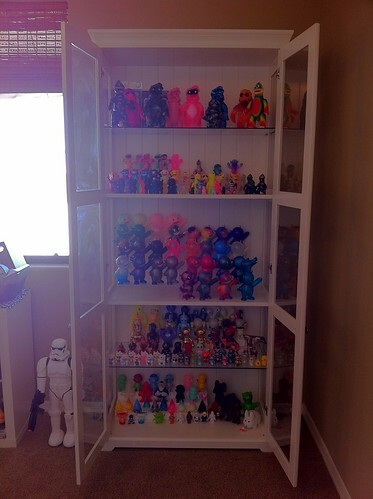 Much nicer and sturdier than Detolf. Pricier, yes, but it does make sense to invest at least the value of -one- of the toys that are going to be inside in a proper display. I really like those cases Oli. What is the height of each section? Would an Ollie fit in there? +1 on the Klingsbo over Detolf. i was thinking of getting two detolf's and making my own base and top. combining the two into one mdf free display case. Looks to be pretty simple. I think he sensen means making the top and bottom parts of the case out of real wood instead of the mdf/particleboard panels. Detolfs are decent but I've got a thing against particleboard myself. As for me I've got a couple of pedestals like these but I made them myself with a wood base. I suppose my ideal large case would have glass/acrylic on at least 4 sides and the door needs a gasket to keep dust out. 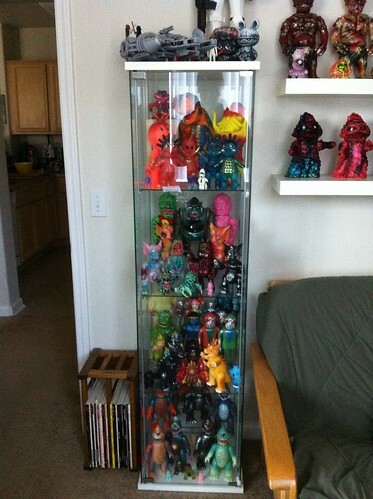 there are several pro display cabinet companies but the prices are way out of my budget. i also looked into just getting a glass or acrylic box to set on top of my existing furniture but that option also seems expensive. you hardly notice the particleboard. all you see is glass and toys. 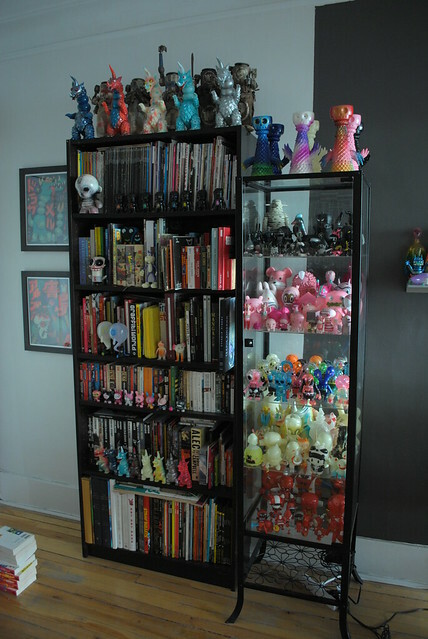 The cases are Billy bookcases from Ikea. I needed shorter shelves for the attic. 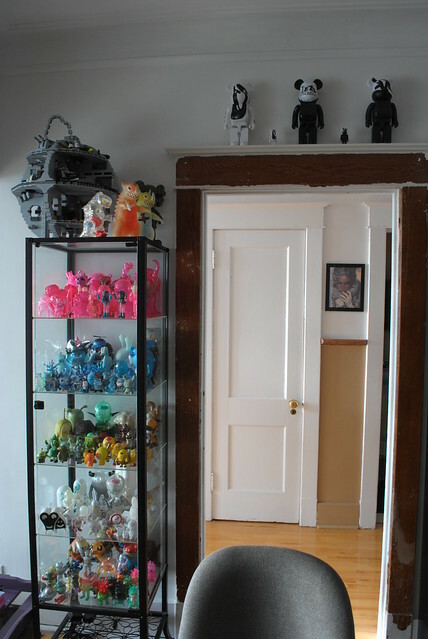 I bought the glass replacement shelves and added UV protective plexiglas and custom frames for doors. By the time all is said and done it was about $190 per unit. I know that is a lot but the added UV piece of mind if worth it, considering how much the toys in each case could be worth. Detolf from Ikea. I'll upgrade at some point but for now it does the job quite well. Awesome set ups so far. Post more pictures people!!! I was lucky in a bad way, an old toy shop near went out of business and the owner ga e me three nice old display cases, solid wood with 1/4 plate glass and rolling front doors and plate glass mirror backs. Also got a really big case from my favorite toy shop when they moved to a smaller place. I'll put up a pict later. I really recOmmend wood cases if possible, the look and feel they give to a collection can't be beat. TattooDougHardy, Alebrije, Vombie and 1 other person like this. I LOVE this case. We got it from some furniture store in Jacksonville. The door slides to the left which is incredible for keeping the dust out! wow Baikin. great display case collection. those must of been some nice toy shops. 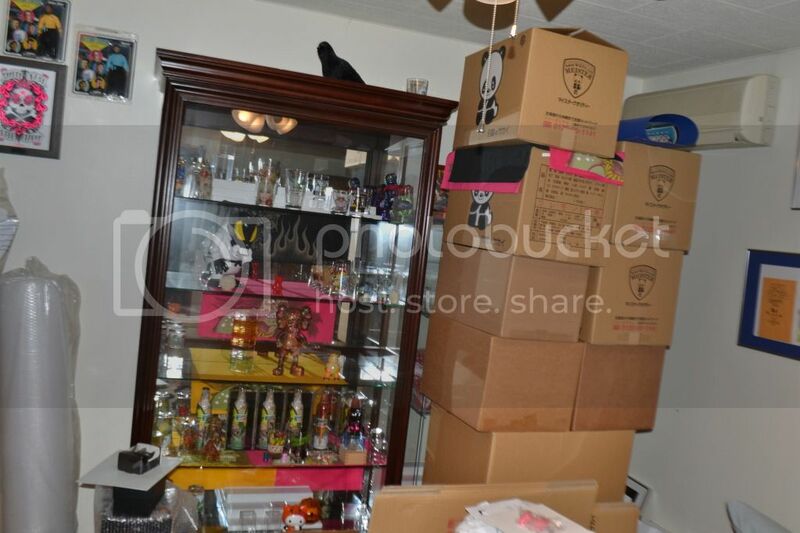 your ready to join the What does the room you keep your display case collection in look like? 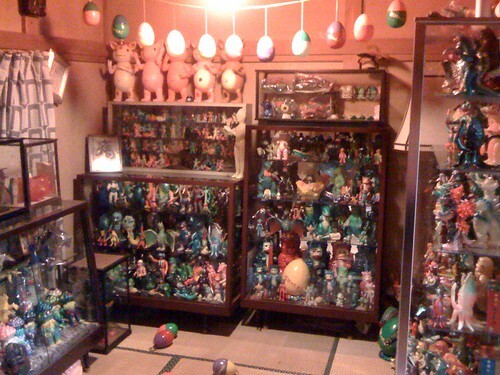 Damn, Baikin, what a fantastic collection (and cabinets)!! Can I be invited over for the Easter egg hunt?